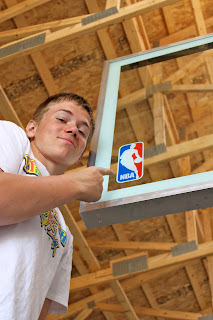 There is a teenage boy at our house whose number one love is basketball. 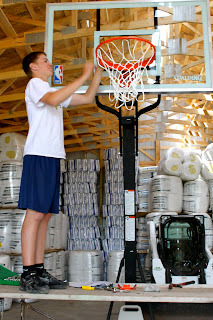 This weekend one of his basketball dreams came true in the barn. Hunter is working this summer, earning a “real” paycheck in our family business in between days of daily baseball practice and numerous games a week. But he wants to be shooting baskets any other minute he can when he isn’t working or playing baseball. 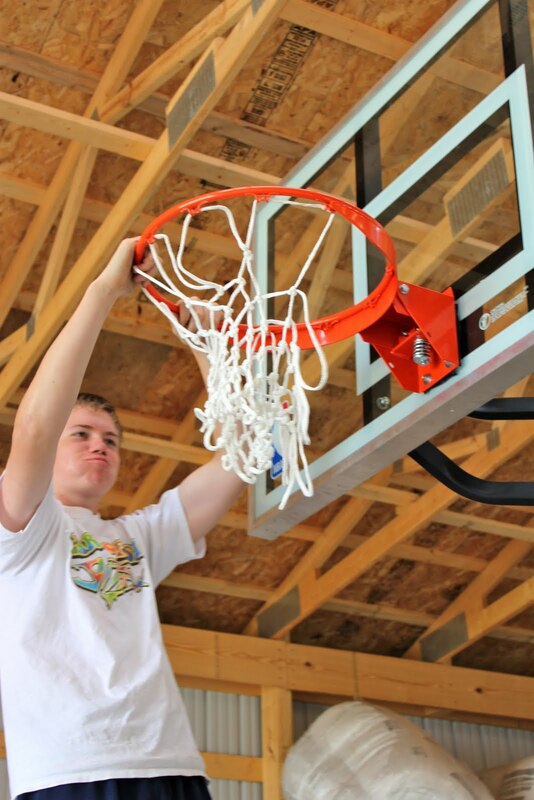 So Nathan and he cut a deal on a high end basket that he is helping earn with his paycheck. 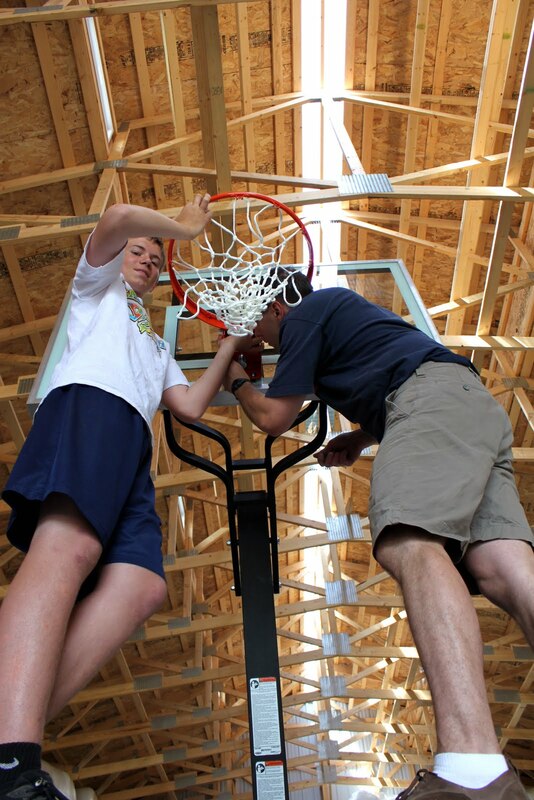 Together they spent hours yesterday putting it together and Hunter now has his own basketball hoop in our new building which Hunter has fondly named “the barn”. Some barns are full of hay and livestock. 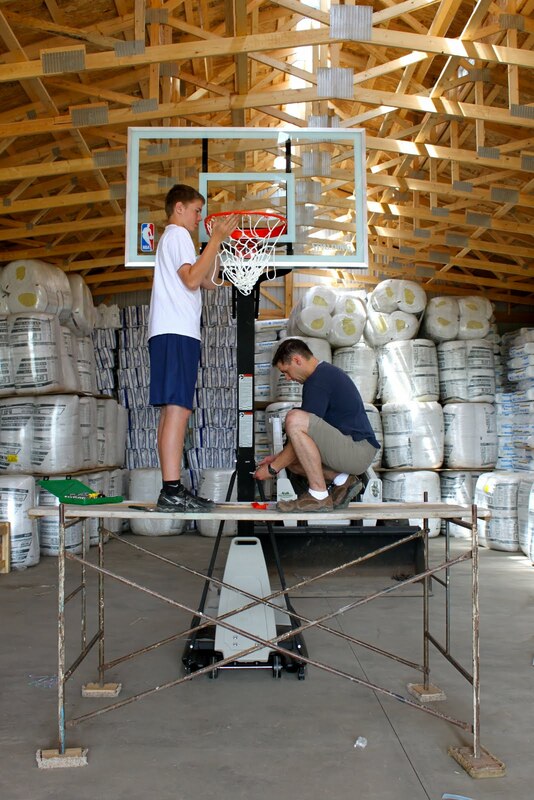 At the present time, this particular barn is full of insulation bales for upcoming building projects through our family business. Hunter has big dreams like any typical teenage boy. We don’t know where his dreams will lead but he is learning discipline, hard work and multiple life lessons through sports. For now his dreams are big in the barn while playing basketball. Standing on the scaffolding he got a good view of what it will be like “throwing it down” (dunking) as he said. Rather than Hunter playing videos games in his spare time, Nathan and I couldn’t be more happy than to see Hunter’s excitement for basketball in the barn. Hunter’s zeal has reminded me of my goals and dreams as a teenager. I worked hard. Many came true. The dreams and results ended different than I expected but nevertheless, it was all worth dreaming for and working towards. Those dreams I had as a teenager built me into who I am today. Dream big. In the barn. On the prairie. Or wherever life has you. Dream big. that is great! 🙂 go, hunter, go! I love seeing stuff like this! My family is into baseball and growing up my dad built a pitcher’s mound in our yard for my brothers. My cousin is a good example of dreaming big in a small town. He grew up on a farm near Snowflake (where I’m from), played hockey all his life and now plays for the Houston Aeros. And this past season he was called up to play a few games with the Minnesota Wild! It’s important to have goals and if you work hard you never know what might happen. How wonderful – I know he must be so excited! You have to have dreams!!!! That’s what moves the earth! My dad added a basketball hoop to the toolshed AFTER he had grandsons…beats the hoop on the garage that his daughters had to use. BTW, love the new blog header! 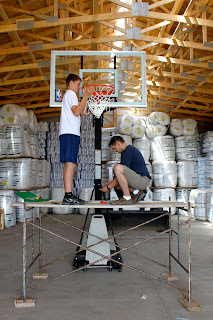 1) Our barn, which is no longer used for livestock, has been transformed into the “sports barn.” We have a basketball hoop, balls, and even a mini golf hole. The kids can ride bikes and have somewhere to play on rainy days. Good times on the prairie!